Memphis Depay is a Dutch professional footballer who was born on 13 February 1994 in Moordrecht, Netherlands.Memphis is two-footed and a winger who plays mainly in the position of left-wing. Currently, he is serving French club Lyon and Netherlands national team. He is widely considered as one of the best young players in the world football. He was also given the Best Young Player in the world award by France Football in 2015. Memphis began his career at the age of 6 by joining local academic club of his hometown, Moordrecht. Staying with the club for three straight years, he was trained and cultivated. In 2003, he united with Eredivisie club Sparta Rotterdam and played for the club till 2006. Eventually, he moved to PSV Eindhoven and played for the youth team of the club until he got promoted to the senior team in 2011. Memphis has also represented Netherlands at all the international levels including U-17, U-19 and U-21. Memphis made his official Debut for PSV on 21 September 2011 in a KNVB Cup match against VVSB whereas his Eredivisie debut came on 26 February 2012, coming in as a replacement in the 89th minute of the 3-2 victory against Feyenoord. After playing several games as a substitute, Memphis was given a chance in the starting eleven against VVV-Venlo, in which he had also scored a goal helping his team to win the match by 2-0 in the end. 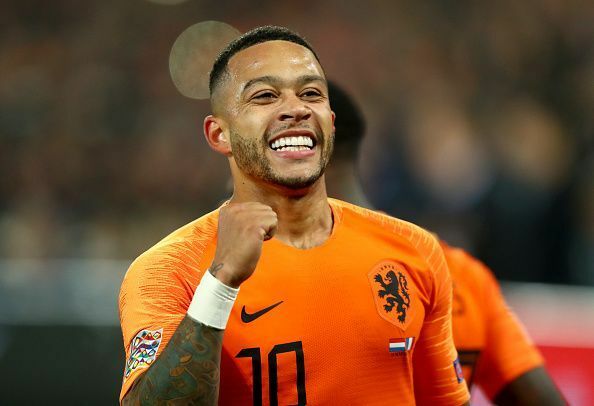 Depay’s international debut for the Dutch team came on 15 October 2013, coming in as a replacement for his team mate Jeremain Lens in the last minute of the 2-0 away win against Turkey in the World Cup qualifiers. 2013-14 season of the Eredivisie was proven to be the breakthrough season for him as he scored his first goal of UEFA Champions League qualifiers on 30 July 2013 helping his team to claim a victory against Zulte Waregem. Afterwards, Depay also helped PSV to secure 4th place in the Eredivisie league point-table, scoring a goal in a 2-0 victory against NAC Breda on the final day of the season. After the successful Eredivisie season, he got selected in the 23 man squad to play 2014 FIFA World Cup. Coming as a substitute in a group match against Australia, he set up an equaliser and then hit a decisive goal in the 68th minute of the game. With this goal, he also became the youngest Dutch player to score a goal at the World Cup. On 23 June, he again scored a goal in the final group match against Chile, helping his team to get top seat in the group point-table. Afterwards, Netherlands finished the tournament on 3rd place and for his amazing performances in the tournament, he was also shortlisted for the Best Young Player Award, though he hadn't got that at the end. On 18 April 2015, Depay led PSV to their 22nd Eredivisie title scoring 22 goals through the tournament and being the top scorer. On 7 May 2015, PSV confirmed Depay's transfer to Manchester United. However, his time with the United was not that good. Staying with the club till the end of the year 2016, he played 53 games scoring only 7 goals. On 20 January 2017, Depay signed a four-and-half-year contact with his current club Olympique Lyonnais, popularly known as Lyon. With his current club Lyon, Memphis has played 62 games till date scoring 20 goals and providing 18 assists. Overall, he has featured in 256 games of the various football leagues across the club scoring 87 goals. He has also got 57 assists in his name. Most of his goals have come in Eredivisie, 39 in 90 games. In Ligue 1, he has netted 17 times in 46 matches. In the international football, he has played 36 matches for Netherlands scoring 9 goals. Is Memphis Depay ready for a top club now? Premier League 2018-19: Should Manchester United re-sign Memphis Depay? Is Memphis Depay the answer to Manchester United's offence problems? Is Memphis ready to return to Manchester?